When deciding to sell a piece of real estate, there are certain things you must disclose about the property to the buyer before the sale can go through. Disclosure laws are put in place to protect the buyer from unknowingly purchasing defective property. Not disclosing certain information about the property can jeopardize the sale, or worse, invite a lawsuit. The main items that need to be disclosed are any defects with the home. This includes, but is not limited to, plumbing problems, water leaks, cracks in the foundation, insect infestations and toxic materials in the home — such as lead, asbestos, carbon monoxide or mold. Be sure to fully disclose anything that may be pertinent to the buyer before purchase. Some disclosure laws include reporting issues with neighbors and whether the home has a criminal or notorious past. If you are unsure about some information regarding your real estate, one option would be to state that you do not know that specific information. Remember though, if you knowingly withhold information, it may cause the sale to fall through or could be used against you in a lawsuit. Does It Make Sense To Have A Pre-Inspection Done? Sellers can also have their home inspected prior to placing the property on the market to prevent any surprises of unknown problems with the home. This way, defects can be fixed before listing the property, and the disclosure form can state the problem has been fixed. Buyers will almost surely want an inspection prior to closing, and a pre-inspection may suffice. Disclosing information does not mean the seller needs to fix the problem. Any disclosed problems with the real estate can become a negotiation point. Remember, the most important thing is to be honest about any known issues with the property. 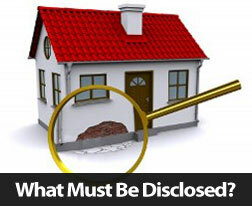 Real estate disclosure laws may be different depending on the state in which you live. The best way to know what you need to disclose in your area is to check with your trusted real estate agent or property attorney and discuss any potential property issues with them before you fill out the seller disclosure form. This entry was posted on May 14, 2013 at 5:46 am and is filed under Home Selling Tips. You can follow any responses to this entry through the RSS 2.0 feed. You can leave a response, or trackback from your own site.